Originally posted at Making History Now. In my research, I am always delighted to discover one of God’s “unknowns” who achieved great things. One such was ethnic evangelist and church-planter, Elias Letwaba. History failed to note him, and for two main reasons. First, he wasn’t active in the cities; his ministry was out in the remote bush of the Transvaal, South Africa. And he was black, but belonged to a denomination (the Apostolic Faith Mission) which practised racial segregation, even holding separate baptism services for blacks and whites. Letwaba’s very birth had the supernatural about it. His mother, a nominal Christian, was visited by a man in white robes who prophesied that she would bear a son who would “carry my gospel message to many places” but suffer many trials. She didn’t stay nominal after that! The Letwaba home was a house of prayer. Elias was born in 1870 and even as a boy was sensitive to God and felt tinglings in his hands when he read in the Bible of healings and deliverance. One day he prayed over a lame girl in Jesus’ name – and only found out five years later that she had been healed. He tried several churches but knew something was missing. His heart yearned for the New Testament “signs and wonders”, and a people joined in their hearts. 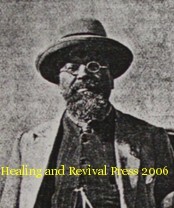 In 1908 he travelled to Doorfontein to hear the American evangelist and healer John G Lake. The power of God was very obvious in the meeting, with people being healed and set free. Lake sensed something in Letwaba and invited him on to the stage. This caused outrage among the white Christians, who were all for throwing Letwaba out. “If you throw him out, I will go too“, said Lake, which stilled the storm and Elias remained on the platform. The two men became brothers from the heart; Lake invited him into his home, where Letwaba received his personal Pentecost, the ‘baptism in the Holy Spirit‘. When Lake and his team left for Bloemfontein, they invited Letwaba to go with them. Under Lake’s training, Letwaba began an itinerant ministry, walking hundreds of miles between far-flung villages. He was often beaten, kicked and verbally abused, but when he prayed for the sick, many were healed. From time to time, Lake would come to Letwaba’s home in Potgietersrus and the two would minister to people together – always attended with remarkable divine happenings. After Lake returned to America in 1913, people began to recognise that Letwaba had, in some special way, inherited his mantle in ‘power ministry’. On one occasion, during a heavy drought, he prayed for rain for one village, prophesying that it would happen that night (there were no weather forecasts in those days!). And the rain came. In time, Letwaba spoke seven languages, founded and headed a Bible College with a reputation for depth and godliness, and had an apostolic circuit of thirty-seven churches. He insisted that his congregations be tribally mixed, which required up to three interpreters at every service. It has been roughly estimated that 10,000 people found healing as a result of his prayers. For all this, he remained a humble man, writing sermons pleading for personal holiness and humility, and leading by example in those areas. He died in 1959, aged 89, a father of the African church – yet surprisingly unknown outside his beloved Transvaal. Trevor Saxby is a mentor, friend to many, with a PhD in church history. I love learning from the ‘movers and shakers’ of the past, as I want to be one today! Previous PostThe Mission of JesusNext PostWhy Did Jesus Say He Came to Bring a Sword?